What do you use and what’s it for? I’m talking software, and personally, my most used program would be Firefox. 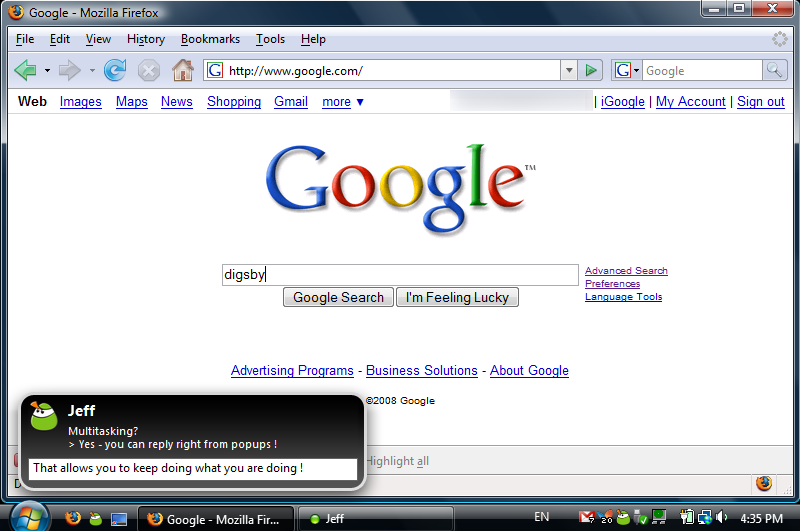 I use it as a web browser alternative to Internet Explorer, its free, and you can get it from Here. Thunderbird, Mail Client, Freeware, Another fantastic Mozilla product but this one being for mail. Still wonderful. Great interface with easy inbox set up for my GMail. Sunbird, Calender(I may be switching to the Thunderbird extension/calender client, Lightning, but I’ll wait and see), Freeware, Another great Mozilla product this one an iCal type application, keeps track of all my events, and can easily be synced with GCal. iTunes+Foobar, Audio Playback, Both are free, Obvious choices here, Foobar I use for the actual playing of the music, iTunes is for syncing to my Pod. Pidgin, Instant Messaging, Free, Can instant message over most mediums, mine being AIM and MSN, barely ever slows anything down. Photoshop(Extended CS3)+Dreamweaver(CS3), Image editing-Web page editing, 1000$-400$, Obviously for working with graphics and web pages. No download link since its not free, but there is a link to Adobe’s site. joost, TiVo Thing.., Free, I use joost to watch tv shows and internet TV shows. This is pretty new, be sure to check it out. OpenOffice.org 2.3, Office programs, Free, Used for school stuff, things like that. CCleaner, Crap Cleaner, Free, Cleans out history and temporary files from your computer, saving space. Skype, Voice Chat Program, Free, Voice chat with your friends and call phones for a small price. Post your version of this on your blog or put it in a comment! Now playing: Avenged Sevenfold – [City of Evil CD1 #11] M.I.A.